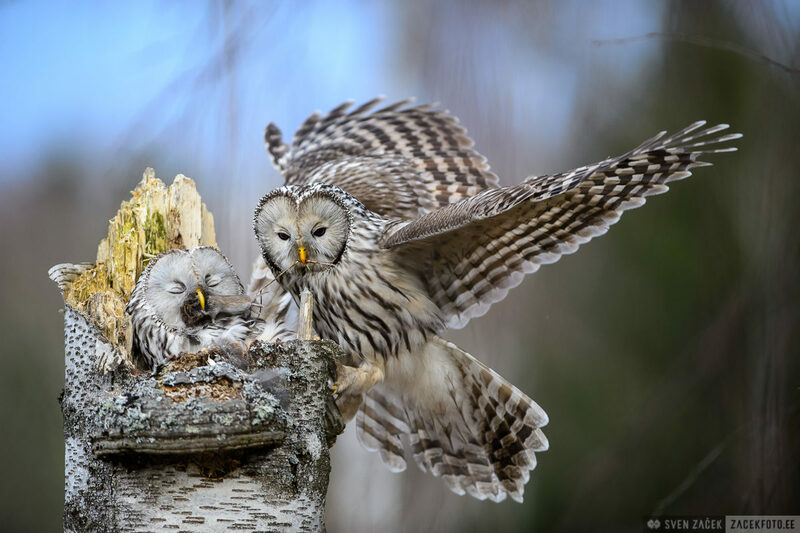 During nesting the male Ural owl has the responsibility of providing food for its mate. Usually when evening arrives the female starts calling out to the male reminding him that it is dinner time. After and hour or a bit more the male arrives with food. However, the pair pictured here had developed a unique understanding. During the 12 years I have been observing Ural owl families, the male has never brought food without the female begging for it, but this male was on the nest with food day after day at the same time without being reminded by the female. This photo was awarded second prize in the Nature Photo of the Year 2018 competition in the category “Animals in action”.